Ohio has quite a diverse fruit industry; and the high value fruit crops being worked with at The Ohio State University South Centers are aronia, blackberries, blueberries, elderberries, gooseberries, hardy figs, hardy kiwis, raspberries, wine grapes, and other emerging fruits. According to the 2012 USDA Agricultural Census, Ohio had around 352 acres of blackberries, 381 acres of blueberries, seven acres of currants, 1,980 acres of grapes, 401 acres of raspberries, and 24 acres of other berries. Since 2012, quite a few growers have planted more berry crops. The biggest area of growth has been blackberries, blueberries, and raspberries. While Ohio may not boast the largest acreage in berry crop plantings, these small fruits are worth a lot of money. For example, an acre of blackberries on a rotatable cross trellis can provide a gross revenue of $45,000, and an acre of blueberries can generate somewhere between $16,000 to $40,000 in gross revenue. Dr. Gary Gao, Extension Specialist/Associate Professor and co-Director with the Center for Specialty Crops at OSU South Centers, says he feels very honored and privileged to support such an important sector of Ohio’s agriculture. Extension Programs in the areas of high-value fruit production have been the cornerstones of Gao’s work at OSU South Centers in Piketon. Three of the main educational programs are the Blueberry, Bramble, and Wine Grape Workshop in March; Blueberry, Bramble and Wine Grape Field Night in July or August; and the Grape and Wine Analysis Workshop in December. The program also provides extension support to OSU Extension offices across the state of Ohio, Ohio Produce Growers and Marketers Association, Ohio Grape Industries Program, and Farm Science Review offered by The College of Food, Agricultural and Environmental Sciences at The Ohio State University. Dormant pruning of berry crops is typically the main focus of the Blueberry, Bramble and Wine Grape Workshop. Normally, around a half hour or so is spent in the classroom introducing the program agenda and each other. What follows is a trip to the field in order to show our program attendees how to prune blackberries, blueberries, elderberries, raspberries, and wine grapes. Some years, aronia, currants, gooseberries, and other fruit crops of importance are included. Hands-on pruning demonstrations are always a good way to show folks how to prune. In 2018, the weather was good and the attendees of the workshop were able to learn basic and advanced pruning techniques for their fruit-growing operations. The Blueberry, Bramble, and Wine Grape Field Night was offered in September, 2018, which was later than the typical July or August time frame due to scheduling conflicts. It focused on cultural management tasks, disease and insect identification and management, and fall fruit harvests, as well as key findings of research projects. Both Ryan Slaughter and Gary Gao served as the featured speakers. The popular Grape and Wine Analysis Workshop was held in December, 2018. The program, as usual, drew good attendance and reviews. Drs. Lisa Dunlap (OSU-Horticulture and Crop Science), Gary Gao, Maria Smith (OSU-Horticulture and Crop Science), Mr. Todd Steiner (OSU-Horticulture and Crop Science), and Mr. Patrick Pierquet (OSU-Horticulture and Crop Science) were the featured speakers of this one-day program. Gao called this an excellent example of active collaboration between the Department of Horticulture and Crop Science and OSU South Centers. Farm Science Review is one of the best programs that CFAES offers to farmers in Ohio. Gao has been a regular presenter at the Small Farm Center at this huge show. In 2018, he gave a presentation on container berry production to more than 40 attendees. Despite searing temperatures, the attendees were very engaged and asked a lot of questions. Gao is also actively involved in the planning and delivery of Ohio Grape and Wine Conference. This two-day program is a joint effort between The Ohio State University and the Ohio Grape Industries Program or Committee (OGIC), and draws a large audience from the grape and wine industry. According to a 2016 economic impact study commissioned by OGIC, Ohio’s grape and wine industry has a significant impact of $1.3 billion on the state’s economy annually, is the 6th largest wine producer in the country, and produces and sells 1.2 million gallons or more than a half-million cases of wine. The industry also boasts more than 270 wineries, 8,067 full-time jobs. See findohiowines.com/about-ohio-wineries/economic-impact/ for more information. This project was completed in 2018. Trialed were production techniques of blackberries, blueberries and raspberries in containers. After three years of hard work, Gao is happy to report that berry production in containers can be a viable option in Ohio. The best crop for growers, who do not have acidic soil, to try is blueberries. That pretty much encompasses the entire state, as Ohio rarely sees a soil pH of 4.5. Growers in northwest Ohio may find blueberry a viable crop to grow for the first time ever, if they grow in containers. Sparkleberry (Vaccinium arboretum) is a large shrub or a small tree and can be used as a rootstock for greater adaptability of alkaline soils. The added benefit is that blueberry bushes grafted onto the sparkleberries can turn into a small tree for ease of machine harvest. Homeowners may plant them as small ornamental trees for beautiful white colors in spring, tasty fruits in June or July and red fall color. 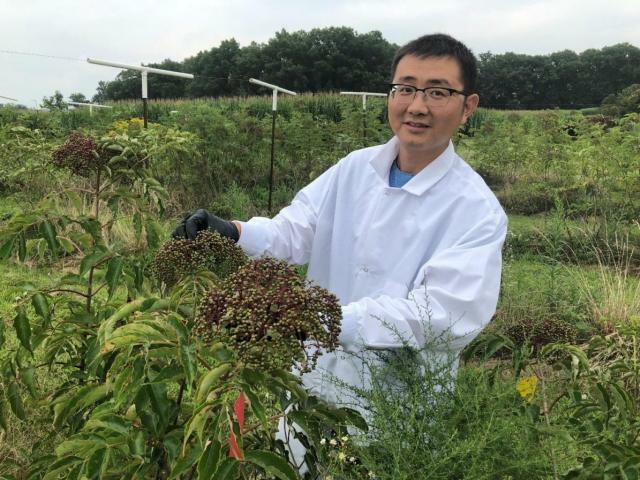 Dr. Pengfei Wang, a visiting scholar from Shanxi Agricultural University, conducted an experiment on fruit color development of elderberries in 2018. American elderberries are a native shrub and can be used in many different ways, such as for wine, jam, medicinal, baked goods, and its flowers can be used in pancake batter. Ricardo Bordignon Medina, a Ph.D. student from Brazil, initiated a study on the use of LED lights on growth and phytochemical production of raspberries. Gao would like to thank Dr. Chieri Kubota (HCS), Dr. Mark Kroggle (HCS), Jim Vent (HCS), Dr. Abhay Thosar of Signify (Phillips Interact), Ryan Slaughter, Dr. Pengfei Wang, and Dr. Rafiq Islam for their help with the project. Gao and Beau Ingle applied for, and secured, a training grant to host eight Cochran fellows in 2018. This was a two-week program. The fellows visited many farms, organizations, and companies in Ohio. It was a very successful program.